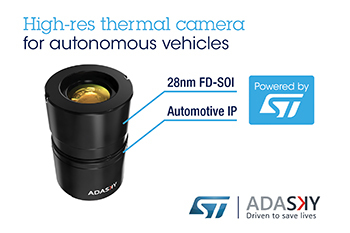 STMicroelectronics (NYSE:STM), a global semiconductor leader serving customers across the spectrum of electronics applications, and AdaSky, an Israeli-based start-up bringing far infrared (FIR) technology to the automotive market to enable vehicles of tomorrow to see further and better, today announced a collaboration, in which AdaSky’s FIR thermal camera embeds custom silicon co-designed with and manufactured by ST in its proprietary 28nm FD-SOI manufacturing technology. The complete sensing solution from AdaSky, called Viper , aims to enable autonomous vehicles to see and understand the roads and their surroundings in any condition. Having complete sight and perception of the roadway, other vehicles, roadside infrastructure, and obstacles, especially in challenging lighting or weather conditions, is fundamental to the safe operation of next-generation autonomous cars. To achieve 24/7 autonomous driving, vehicles will rely on the fusion of complementary information streams provided by different sensors. No sensor or camera in operation today can capture all of the information on its own and each has challenges in certain lighting or weather conditions. Passive infrared vision, like that in AdaSky’s Viper, when used in a fusion solution, can help close the gaps to provide accurate sight and perception without fail in dynamic lighting conditions, in direct sunlight, in the face of oncoming headlights, and in harsh weather. The new camera uses an FIR micro-bolometer sensor to detect the temperature of an object. In an ADAS solution, Viper uses proprietary algorithms based on Convolutional Neural Networks to classify obstacles and show them in a cockpit display to give the driver an early warning. This warning comes several seconds earlier than it would when using a conventional sensor in the visible wavelength and is even faster than what is possible with the human eye. Viper has been designed in ST’s proprietary 28nm FD-SOI manufacturing technology and uses ST IP that is fully qualified for automotive applications. Prototypes are under evaluation by carmakers, targeting a start of production in 2020. About AdaSkyAdaSky brings far infrared technology to the automotive market, aiming to empower the vehicles of tomorrow to see further and better - whenever. AdaSky’s founding team is made up of veterans from the semiconductor, thermal sensor, image processing and computer vision market. They have been developing state-of-the-art FIR sensing solutions for the last decade. Now, the company’s multidisciplinary team of experienced engineers has further innovated and adapted the solution to the specific needs of self-driving cars, making AdaSky’s solution a critical addition to cars to eliminate vision and perception weaknesses for fully-autonomous vehicles.